WELLINGBOROUGH'S Teamwork Trust charity has been awarded £1,000 from a community fund set up by Stanton Cross house builder Bovis Homes to provide much needed funding for Wellingborough's most deserving community projects. 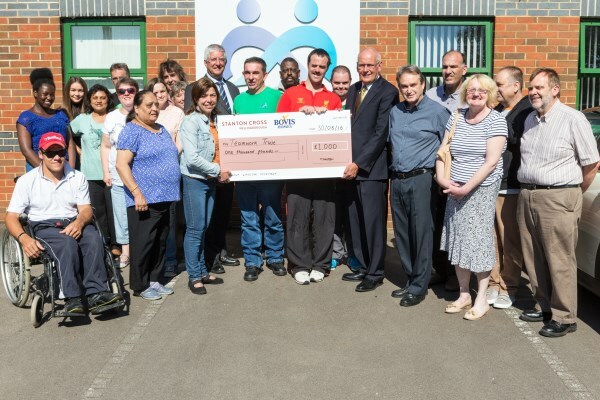 Teamwork Trust is the second local group to benefit from the Stanton Cross community fund and provides a wide range of programmes and services for vulnerable adults who have short-term or enduring mental health issues, learning difficulties or physical disabilities. The award of £1,000 will support the upgrade of Teamwork Trusts' existing kitchen facilities at their Wellingborough centre, providing a much needed social space for its members to share advice, support and experience. Members will also have the opportunity to learn how to cook and gain invaluable work experience in the kitchen, preparing them for employment and independent living. Teamwork Trust in Wellingborough is a registered charity and relies heavily on community fundraising for financial support. It has been operating for over 30 years and has helped hundreds of people in the community with mental health classes and counselling and by offering a friendly, supportive environment where people can make new friends and regain self-esteem and confidence whilst building a range of skills. This includes educational classes, activities and days out as well as counselling services for the local community. John Lougher, Bovis Homes Group Land Director responsible for Stanton Cross, said: "We are delighted to award Teamwork Trust in Wellingborough the second Stanton Cross award, which will provide much needed funding for the redevelopment of kitchen facilities and improve the services on offer to their members. Teamwork Trust does incredible work with the local community and is a very worthy charity which we are extremely proud to support." Nick Hayton, Business Development and Fund Officer at Wellingborough's Teamwork Trust added: "We are absolutely delighted to be offered the Stanton Cross Community Award, which will make a huge difference in helping us to redevelop the Teamwork Trust's kitchen facilities. This will allow us to teach our members cooking and living skills and gain food hygiene qualifications which could lead to work experience and employment. It is great news for our members and we are extremely thankful for the generous donation." Stanton Cross is a £900 million major residential-led development which will significantly transform Wellingborough with new homes, improved infrastructure, community facilities and green open space. The development, which is being delivered by Bovis Homes will include 3,650 homes and create in excess of 3,000 jobs. In addition, it will provide 110 acres of employment land and new schools for Wellingborough when complete. The Stanton Cross Community Award will make a quarterly donation of £1,000 to local charities and community groups.